December 21, 2018 -- MR guidance is emerging as a powerful tool for real-time monitoring of radiation treatments, offering excellent soft-tissue contrast and the ability to track intrafractional tumor motion. Hybrid devices for MR-guided photon-based radiotherapy are now in clinical use. But to date, no such combined system exists for proton therapy. Now, a team from OncoRay at the Helmholtz-Zentrum Dresden-Rossendorf (HZDR) in Germany has integrated a low-field open MR scanner with a static proton research beam line and shown that, in principle, simultaneous proton irradiation and in-beam MRI is technically feasible. Aswin Hoffmann, PhD, and his team installed an open MR scanner (seen on the right of the photo) in the path of the proton beam in the experimental room at OncoRay. Image courtesy of HZDR/R. Weisflog. Proton therapy is highly sensitive to anatomical changes in the beam path, which impairs the targeting precision when treating mobile tumors. The goal is to conform the beam to the exact shape of the tumor tissue, thus sparing as much of the surrounding normal tissue as possible. But, currently, there is no direct way to visualize tumor motion during irradiation. "We don't know exactly whether the proton beam will hit the tumor as planned," explained Aswin Hoffmann, PhD, head of the MR-guided radiation therapy research group at HZDR. Therefore, physicians today have to use large safety margins around the tumor. "But that damages more of the healthy tissue than would be necessary if radiation were more targeted. That means we are not yet exploiting the full potential of proton therapy." Hoffmann and his team want to change that. Working in cooperation with IBA, their objective is to use real-time MRI during proton therapy to improve the targeting accuracy. So why has this not been achieved previously? One major obstacle when developing MR-guided proton therapy is the electromagnetic interactions between the MRI system and the proton therapy equipment. MRI scanners need highly homogeneous magnetic fields to create geometrically accurate images. The proton beam, however, is generated in a cyclotron, in which electromagnetic fields force charged particles onto a circular trajectory and accelerate them. The proton beam is also steered and shaped by magnets, whose magnetic fields can interfere with the MRI scanner's homogeneous magnetic field (Physics in Medicine & Biology, 22 November 2018). "When we launched the project three and a half years ago, many international colleagues were sceptical. They thought it was impossible to operate an MRI scanner in a proton beam because of all the electromagnetic disturbances," Hoffmann said. "Yet we were able to show in our experiments that an MRI scanner can indeed operate in a proton beam. High-contrast real-time images and precise proton beam steering are not mutually exclusive." Another potential difficulty is that when electrically charged particles move in the magnetic field of an MRI scanner, Lorentz forces will deflect the beam from its straight trajectory. However, the researchers were also able to demonstrate that this deflection can be anticipated and, thus, corrected for. The cyclotron at OncoRay delivers a proton beam into its therapy room, as well as into an experimental room with a horizontal static research beam line. Hoffmann and colleagues used the latter for their research activities. To assess the mutual effects on the beam and the MR images, they installed an open MRI scanner in the path of the proton beam. They first tested MRI performance on a healthy volunteer and a patient with a soft-tissue sarcoma of the upper arm, both with the proton beam line switched off. The observed quality of the anatomical MR images was rated sufficient for target volume definition and positioning. They also acquired images of a tissue-mimicking phantom -- without the beam, with energized beam line magnets, and during proton irradiation -- and saw no visible beam-induced image degradation. 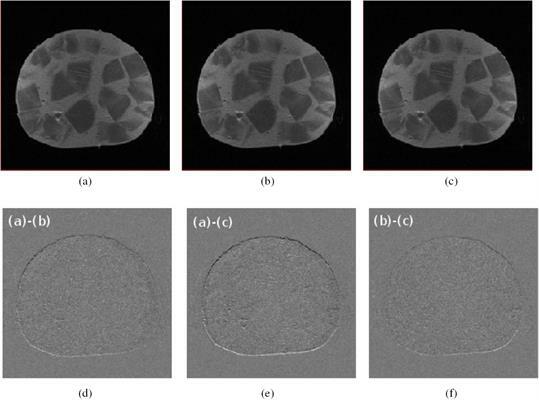 MR images of a mixed sausage without the beam (a), with energized beam line magnets (b), and during proton irradiation at 215 MeV (c). Difference images (d-f) show a submillimeter uniform shift in (vertical) frequency-encoding direction. Images courtesy of Physics in Medicine & Biology, 10.1088/1361-6560/aaece8. In a second series of experiments, the team imaged a piece of Dresden mixed sausage, again without the beam, with energized beam line magnets and during proton irradiation. Difference images between the three conditions revealed a submillimeter, spatially uniform shift in frequency-encoding direction, which can be corrected for. No additional artifacts or deformations were observed, indicating that no severe image degradation was introduced by either the beam line magnets or the beam itself. "When the Dutch research group studied imaging for their MR-guided photon therapy device in 2009, they used a pork chop," Hoffmann noted. "In 2016, Australian researchers demonstrated their MR-photon therapy device on a kangaroo steak. Since we also wanted to go regional for our prototype in MR-guided particle therapy, we used Dresden mixed sausage." The researchers concluded that their proof-of-concept study showed the technical feasibility of simultaneous proton beam irradiation and in-beam MRI. 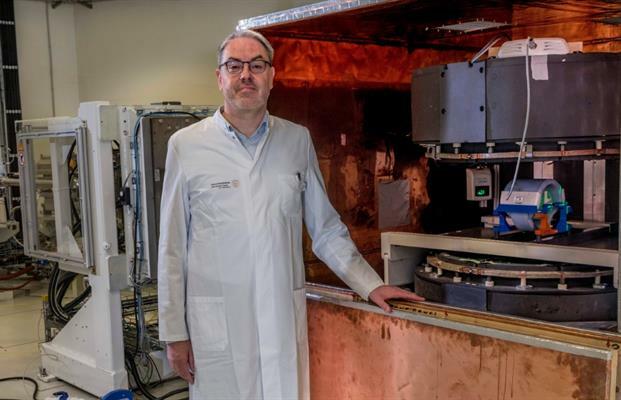 The project is currently entering its next phase, with the goal of developing the world's first clinical prototype for MR-guided proton therapy. "Our mission is to individualize proton therapy biologically and to optimize it technologically towards its physical limits," Hoffmann said. © IOP Publishing Limited. Republished with permission from Physics World, a website that helps scientists working in academic and industrial research stay up to date with the latest breakthroughs in physics and interdisciplinary science.